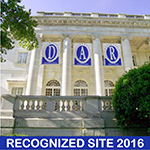 The National Society Daughters of the American Revolution (NSDAR or DAR), founded in 1890, and headquartered in Washington, D.C., is a non-profit, non-political volunteer women’s service organization dedicated to promoting patriotism, preserving American history, and securing America’s future through better education for children. Swallow Cliff Chapter was organized October 31, 1981, and is an active group of women who work to foster the objectives of our Society. We look forward to helping you become a member of DAR and Swallow Cliff Chapter. Please feel free to come to any of our meetings. Contact us for more information.